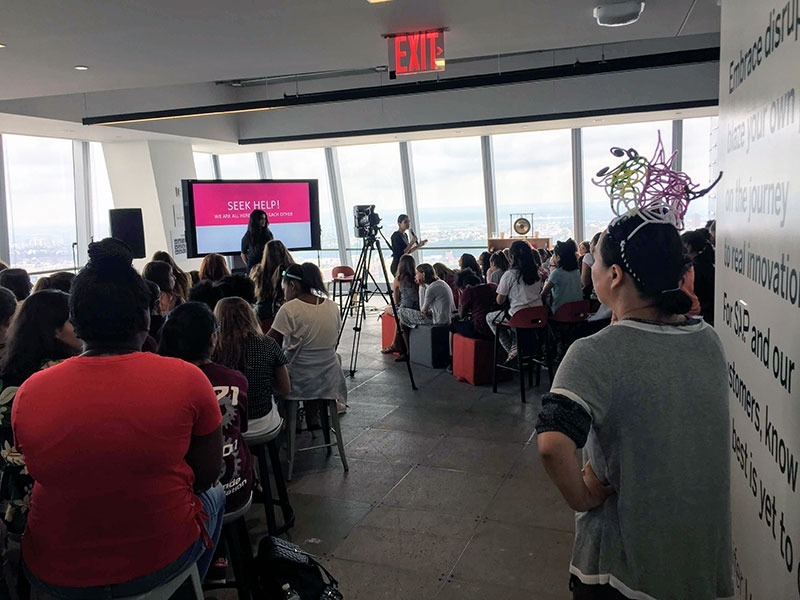 August 22, 2018 -- This past Saturday, one hundred and four girls from Toms River Regional’s three intermediate and three high schools boarded a caravan of buses at 6 AM to spend the day in New York City with over a dozen influential women leaders from across the tech industry. 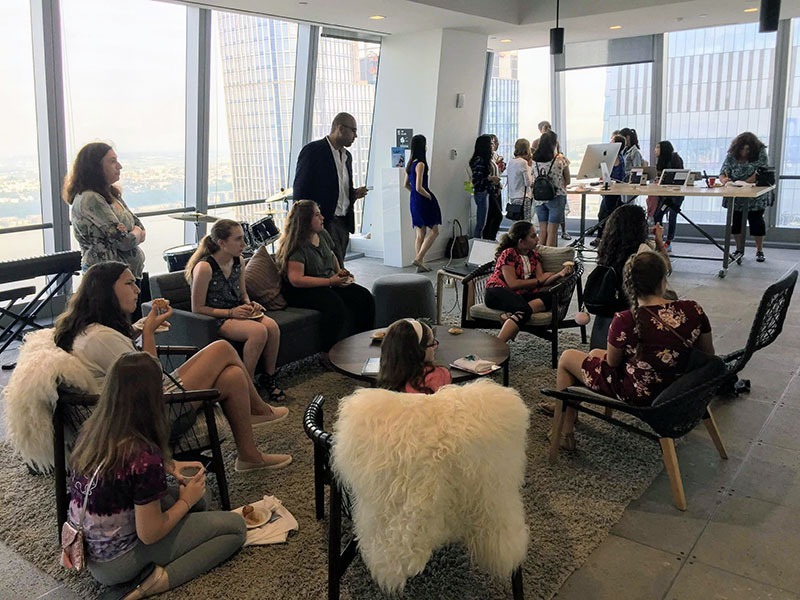 While the sunny views of Manhattan from high up in the office space of SAP Next-Gen were spectacular, all eyes and ears were focused on the message of empowerment communicated through talks, slideshows, and activities. 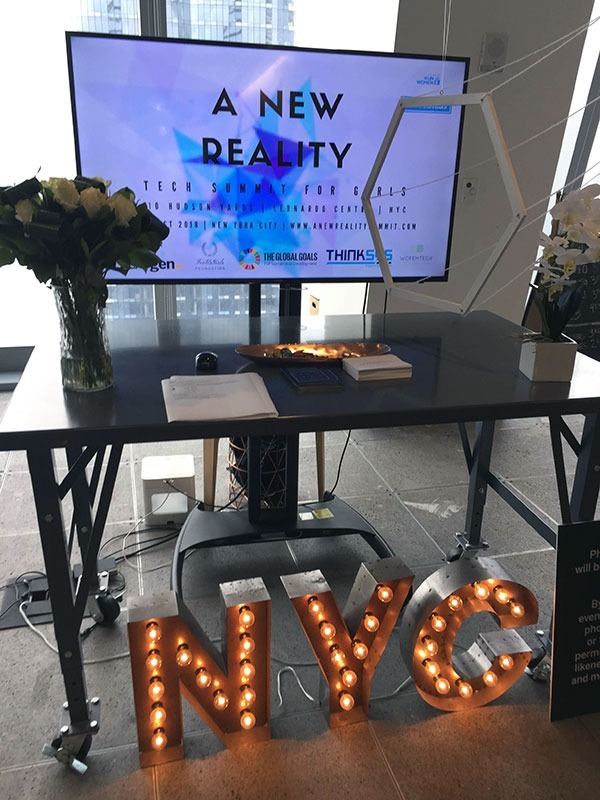 A NEW REALITY: Tech Summit was organized by Aminka Belvitt, founder of the ForUsGirls Foundation, to develop a game-changing experience. 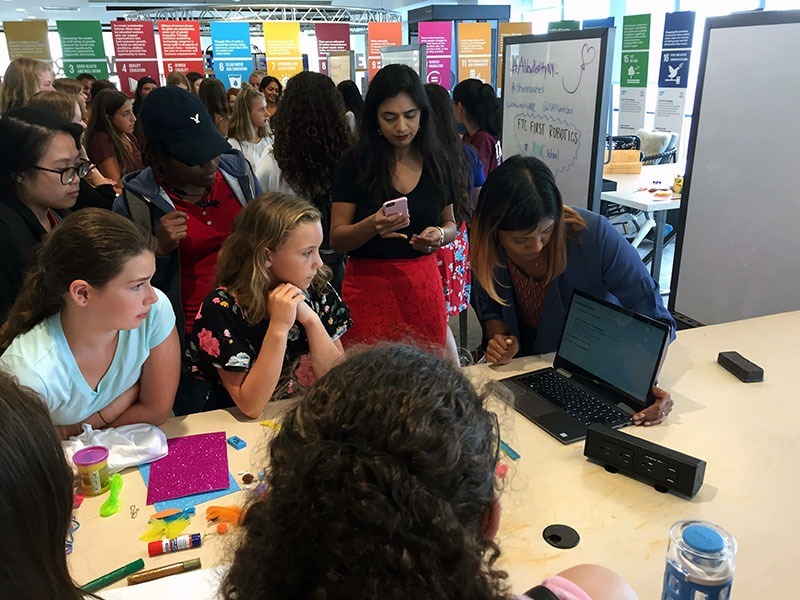 The day represented an extension of a year-long #WeAreTRcoders after school program for girls hosted by SAP, and led by Educational Technology Supervisor Tiffany Lucey, as well as other initiatives the district has implemented over the past five years, including advanced coding language camps, integrated learning, competitive tech clubs, and maker events and curriculum. 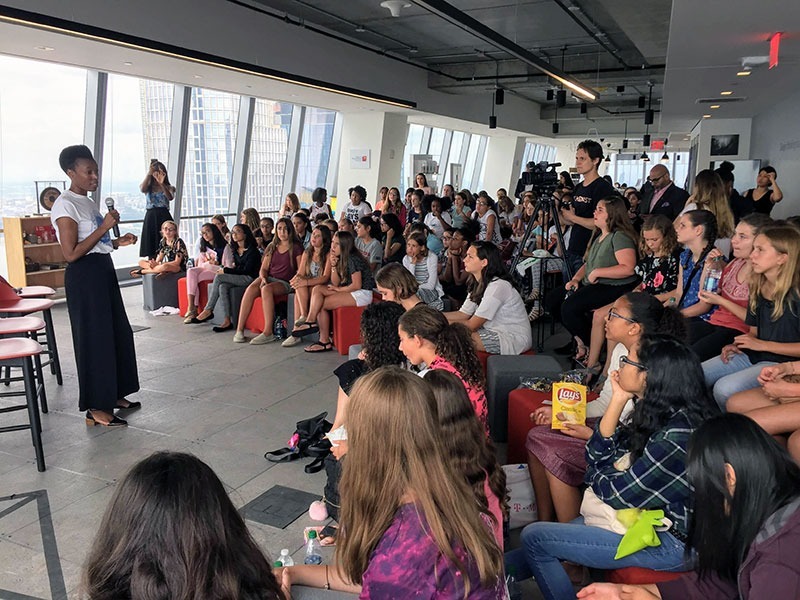 District grants provided transportation and staffing, while funding for breakfast and lunch was arranged by Hemant Ramachandra, principal with Deloitte Consulting, working with software giant ThinkSys. 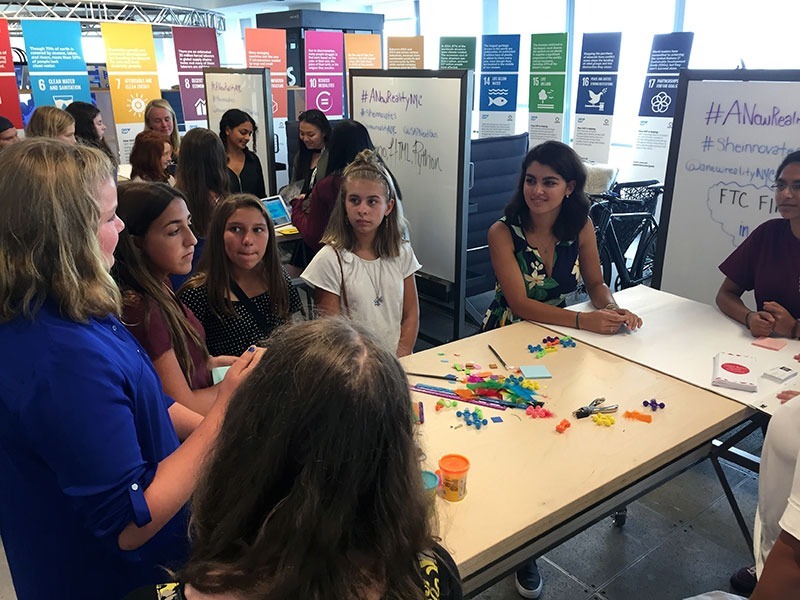 SAP, in partnership with the Hasso Plattner Institute, recently opened its office at 10 Hudson Yards with a mission to “connect the diverse perspectives of next-generation innovators to SAP’s global ecosystem… [of] more than 3,100 educational institutions in 110 countries, 100 innovation and development centers, and startups.” The 48th floor space is overseen by Global Innovation Manager Sandra Moerch and Innovation Manager Ben Christensen. 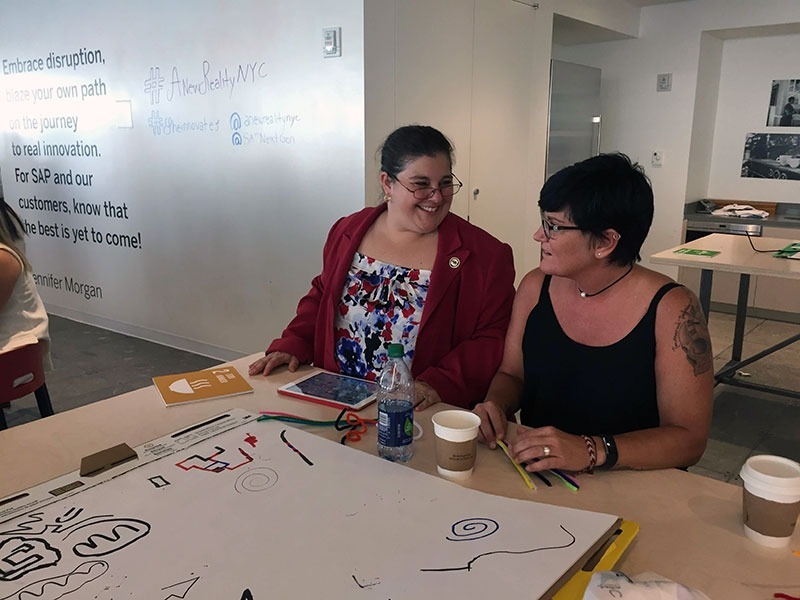 It is a combination of high tech and art, with a mixed reality room and large touch screen displays, as well as musical instruments, texts on creativity, and museum-like pieces placed throughout. 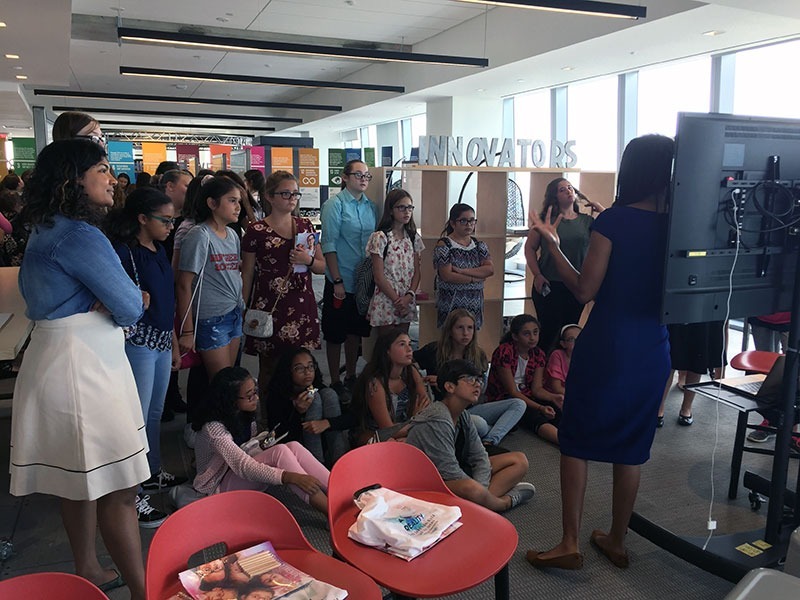 The summit provided opportunities for Toms River Regional students to hear from and speak to movers and shakers in global innovation and to experience examples of technologies like robotics, virtual reality, and coding for the web. 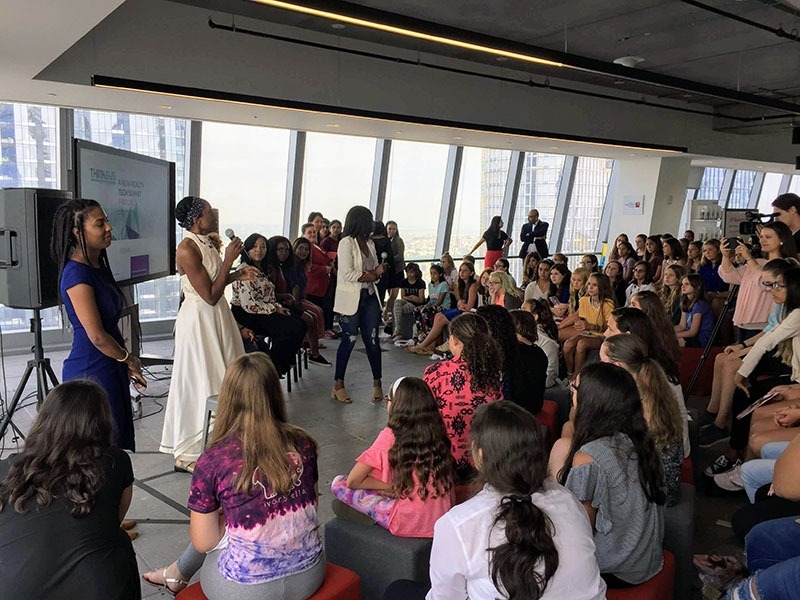 Guests included Raahkee Miller, CEO and co-founder of cryptocurrency company Bitsian Inc; Arielle Gross, business leader at Facebook; Keli Chiu, coding mentor for the ForUsGirls Foundation; and Elizabeth Nyamayaro, executive director of the United Nations Women’s Innovation Unit. 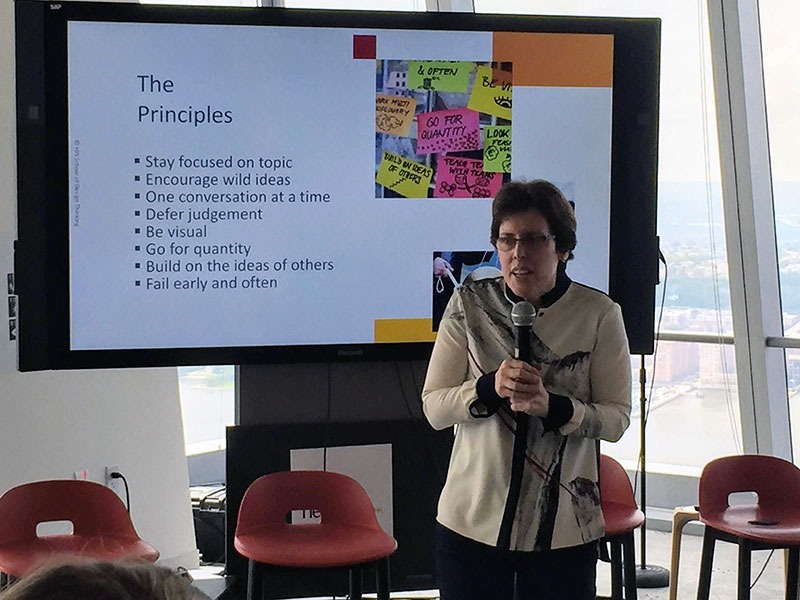 The event was a perfect fit for recently adopted Board of Education goals to make learning more personalized, to adopt a problem-based approach, and to address issues of equity. 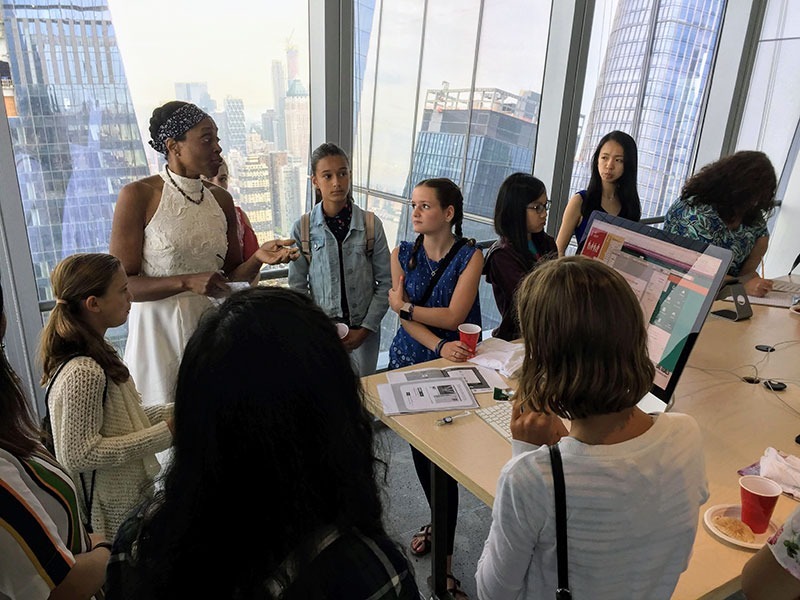 Among the presenters were six students from the district’s robotics teams and tech programs, who spoke about the need for girls to get involved in tech-based opportunities. 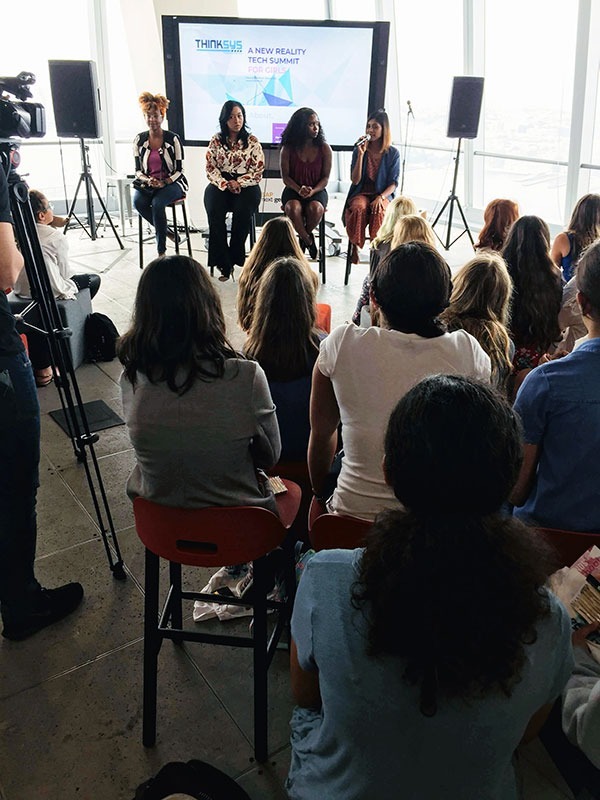 One student leader encouraged her audience to join activities they were interested in even if there were no other girls, assuring them that by breaking through that barrier they would encourage others. 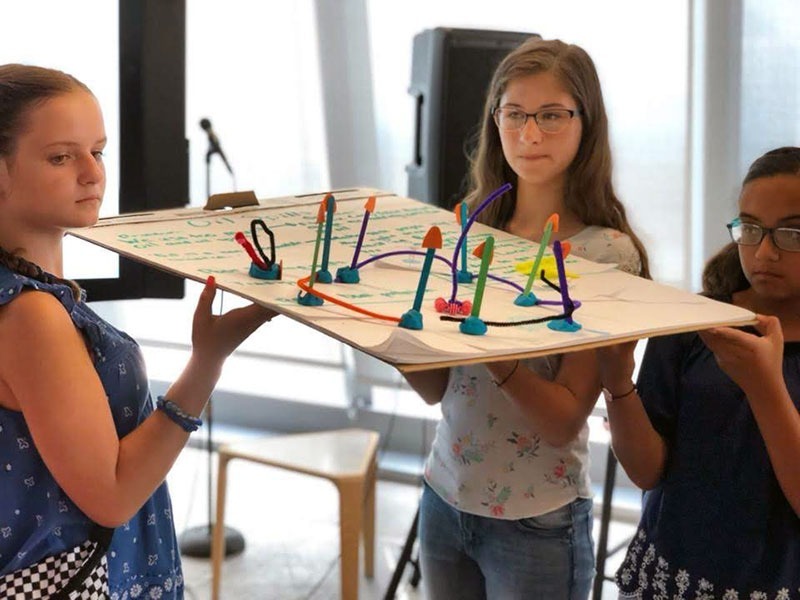 Typically it is Toms River Regional staff, students, and spaces that play host to workshops, events, and activities focusing on authentic applications of technology. 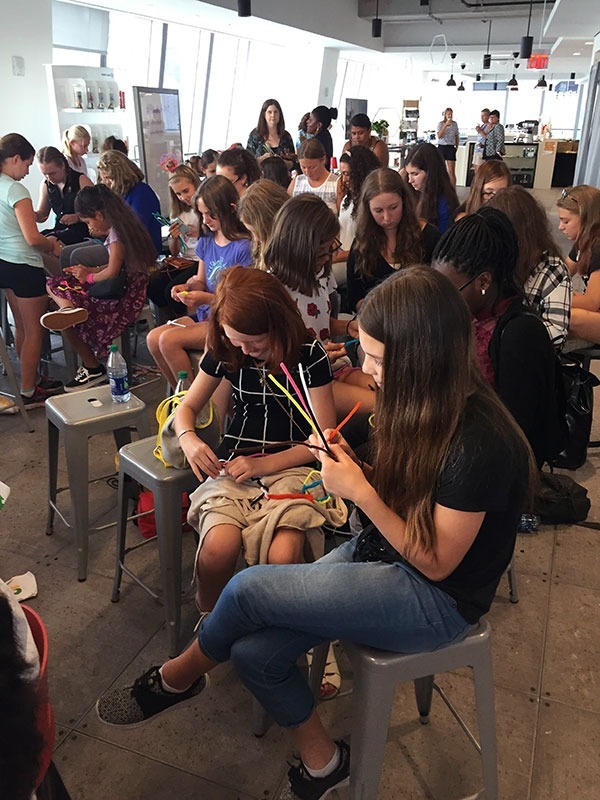 Other school districts have been invited to participate and often play a major role in activities like the Jersey Shore Makerfest, NJ Makers Day, and staff trainings. 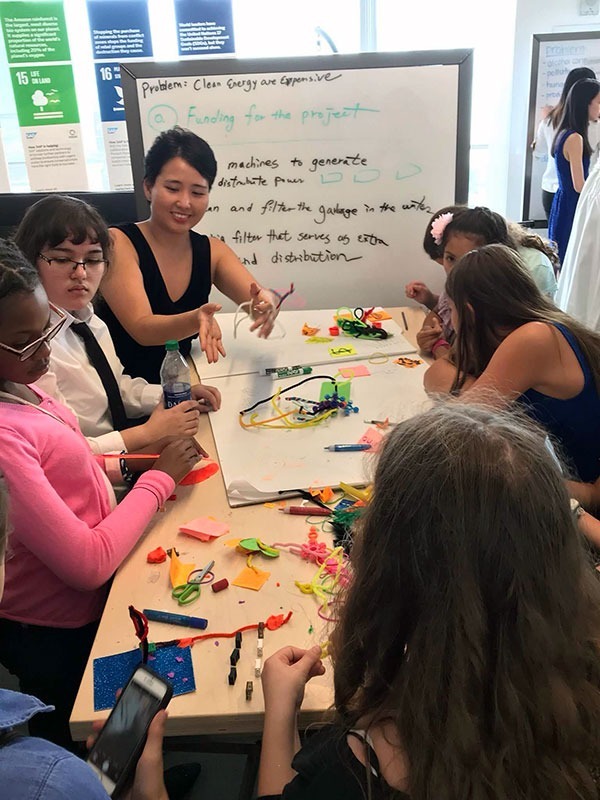 The district just completed a summer coding camp attended by a diverse group of eighty high school students, the first step of a $756,000 grant from the Office of Naval Research written by Natanagara and a team of teachers, administrators, and Mike Kenny, grant writer. 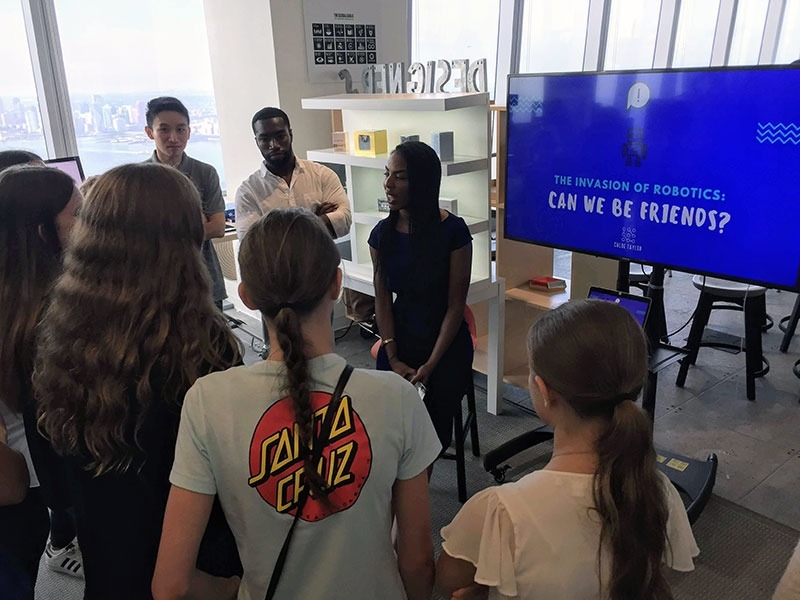 The TR:TechReady program has been designed to bring advanced coding languages across all areas of the curriculum, not just computer science, and teaches students to view coding in the context of real world applications. Students and teachers from other districts joined the initiative, the first of its kind in the country. 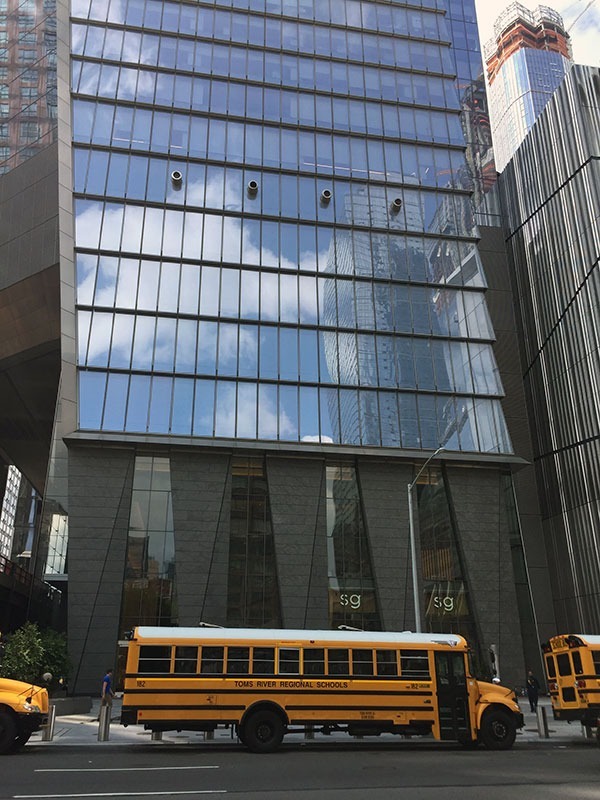 The district has one of the lowest per pupil costs in the state and is the community still most affected and recovering from Superstorm Sandy. It is now struggling with the spectre of significant reductions in funding recently announced by the state. 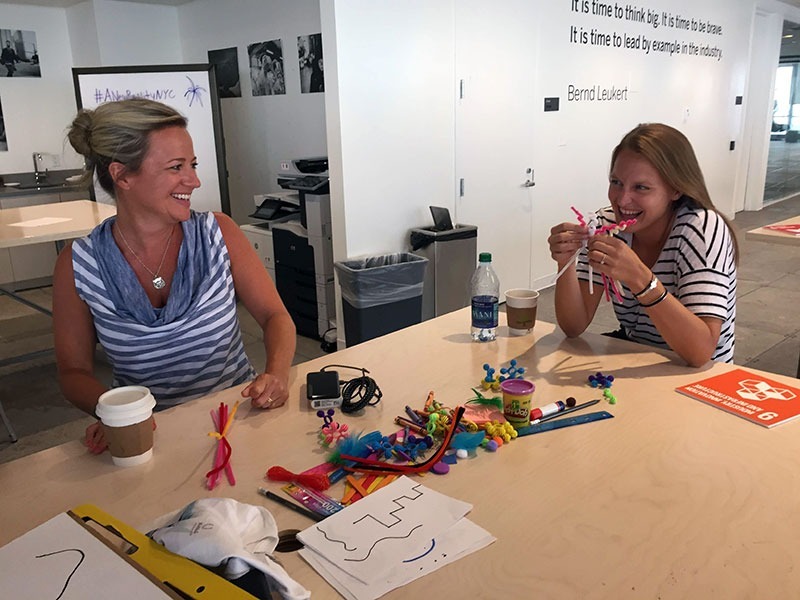 Partnerships, grants, sponsorships, and community activism have become increasingly important for the district to grow and for students to continue to be innovation leaders. 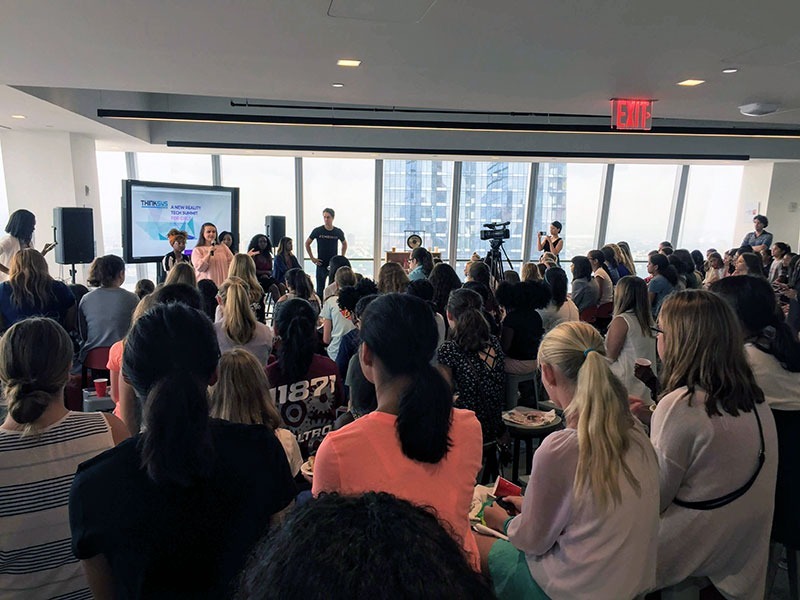 Partners like SAP, NAVAIR, RWJ Barnabas Health, Rutgers University, the Jay and Linda Grunin Foundation, and the Hirair and Anna Hovnanian Foundation have provided both seeds of inspiration and financial support. Other challenges are on the horizon, and school staff are committed to staying ahead of the curve. With initiatives like #WeAreTRcoders and TechReady, Toms River Regional schools are well on their way to meeting a new mandate from the Department of Education: to develop computer science courses required for all high school students by 2022. 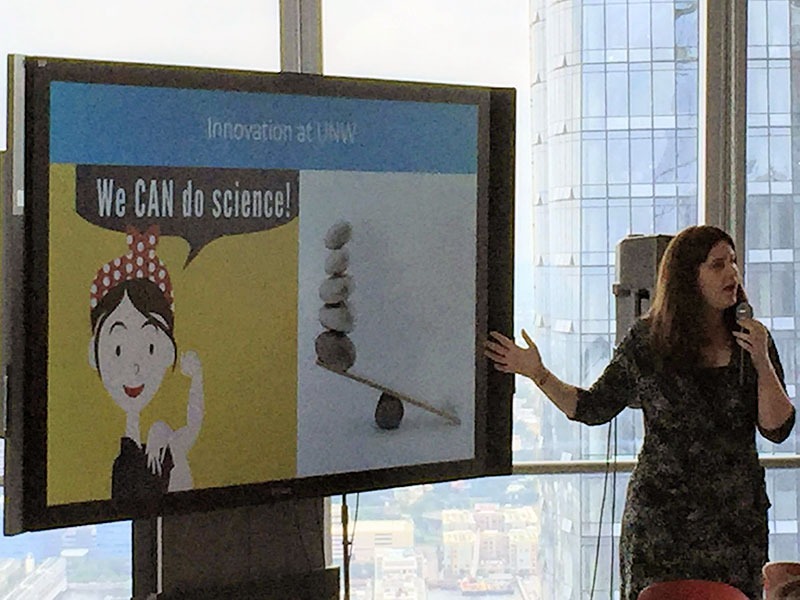 They continue to take a leading role in assuring that all tech implementations have not only authentic purposes in a global market, but personal meaning to every student-- which is the real promise of both our schools and of technology. For more information about district grants and grant-funded programs, contact Mike Kenny, coordinator of the Office of Grants and Communication, at mkenny@trschools.com or 732-505-5500 ext. 500053. 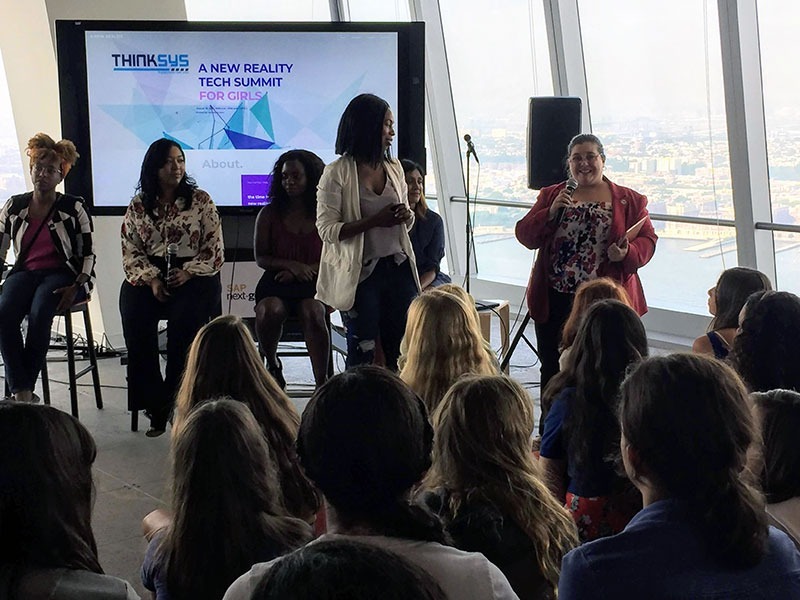 For more information about the ForUsGirls Foundation and A NEW REALITY: Tech Summit, contact Aminka Belvitt at 438-862-0765. 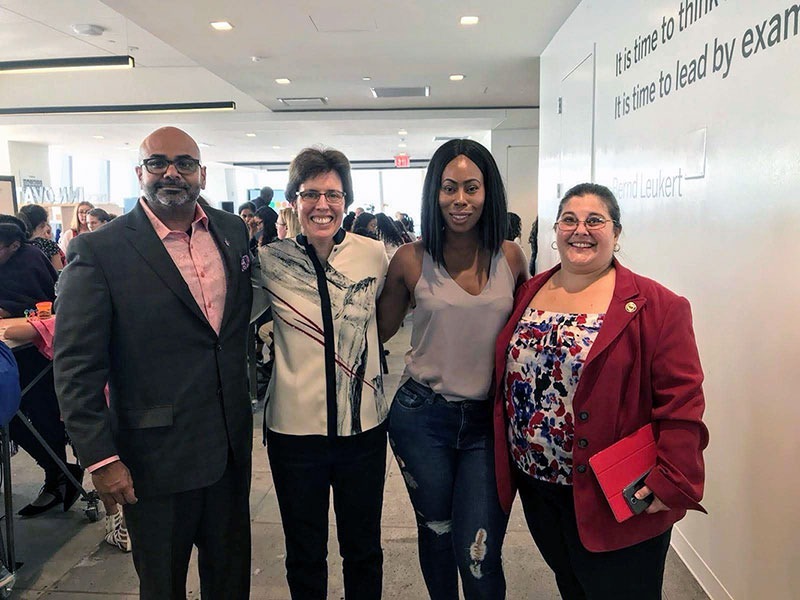 District Educational Technology Supervisor Tiffany Lucey (far right) worked with (l-r) Hemant Ramachandra, principal with Deloitte Consulting; Dr. Joann Halpern, director at Hasso Plattner Institute; and Aminka Belvitt, founder of the ForUsGirls Foundation, to plan the amazing opportunity for TR students. 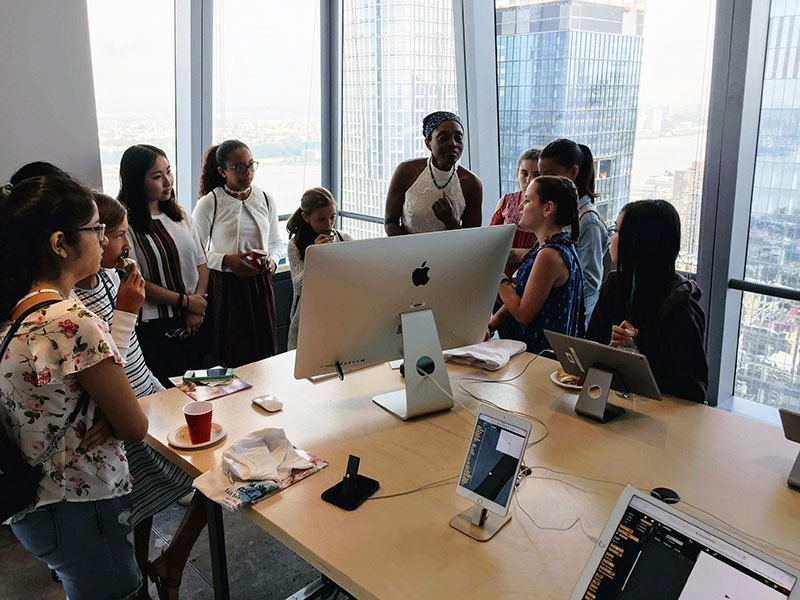 Keli Chiu, coding mentor for the ForUsGirls Foundation, meets with a small group of students while brainstorming. 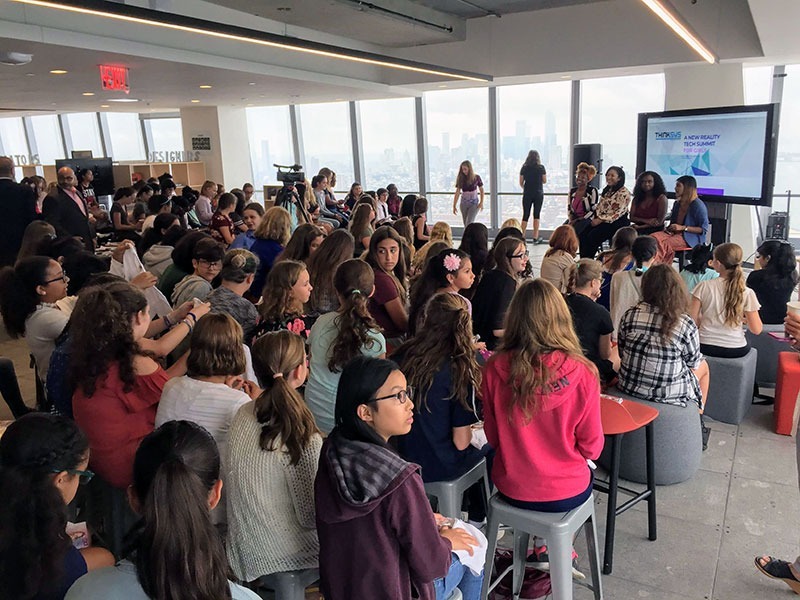 104 Toms River intermediate and high school girls traveled to NYC to take part in a day called "A New Reality: Tech Summit for Girls". More pictures from the day are posted below the story.